So it was really hard for us to finally have a chance to try it out. After reading the article on L.A Magazine that made their Green Onion Sesame Bread seem like some sort of bread epiphany, i was really looking forward to this place. We went family style so we got to sample many dishes. 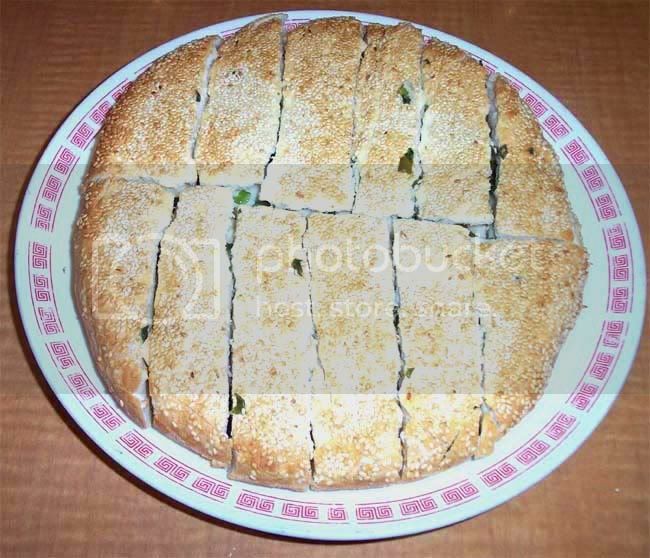 Of course, we tried the Sesame Bread and with my love of Carbs, the thick one, not the thin one. After the first bite, i didn't really see what the big deal was. It was at least an inch thick! And it was kind of dry. The Green Onion didn't do that much for it. The crispy Sesame crust that had formed was probably the best part. They seem to have an affinity for green onion seeing how almost everything we ordered had at least a little bit in it. The Steamed Dumplings were alright, a bit doughy and packed with Green Onions but still alright. The Fried Dumplings weren't really very different other than they were a little crispy but the contents of them were still the same. The star of the meal definitely had to be the Beijing-Style Chicken Mushu. It was chock full of noodles, both thick and thin, rice and clear. Along with the rest of your usual Mushu ingredients. And with the wrapper, it kind of looked like something my Tio Chuy would do to it. A China-China Islamic Burrito, con todo. The Lamb Stew Warm Pot was different. Not that it wasn't delicious in itself, but it's just something that you have to get used to. It was heavily spiced with some sort of sharp spice, i'm guessing star anise. But it was definetely something you have to get used to. With it's tender chunks of Lamb, Tofu, glass noodles, and onion. We ended up with more than half in left-overs so...yeah. Final Verdict, i would come back. But next time, i'm trying the flat Sesame Bread. And not that much FooD!! !